Transferring files between android devices isn’t all the difficult using Bluetooth and all. But sometimes, there are instances when you are in need to transfer bigger files and Bluetooth can actually turn out to be really slow, moreover, it keeps you stationary (more or less) considering that in order to maintain the Bluetooth link you have to stay within a certain radius. 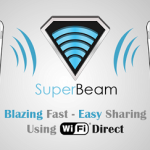 There is a better and faster option for you to transfer files between your devices now and that better option is called SuperBeam which is a free application compatible with Android 4.0 and higher, and also available at the Google Play Store.